All Materials used for chain cables and accessories are to be supplied by works approval by class society. For grade 3 steel bars, detailed material specification including manufacturing procedure, deoxidation practice, specified chemical ompostion, heat treatment and mechanical propertiy required. 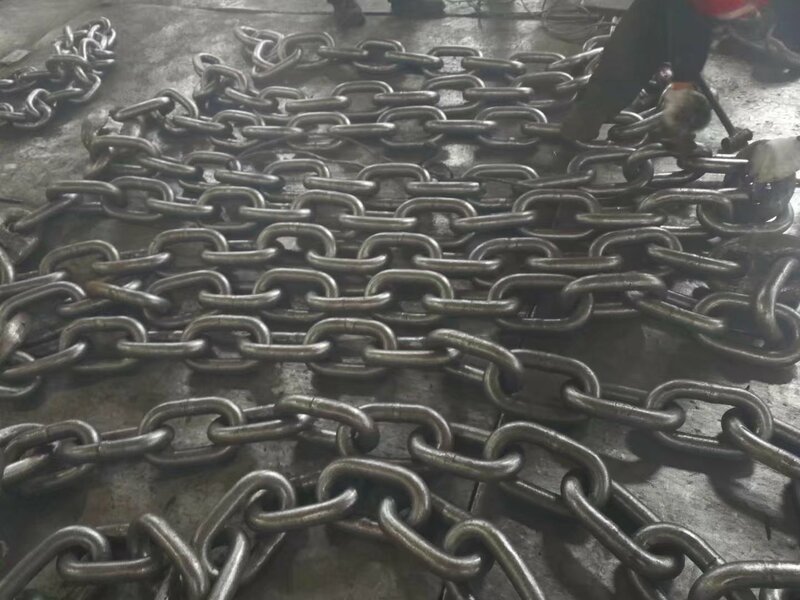 JINBO MARINE supply all kinds of anchor chains, Grade U2 and Grade U3, the size is from 12.5mm to 132mm; Our marine anchor chain is supplied with high quality, reasonable price and fast delivery, ABS, LR, BV, DNVGL, RINA, NK, KR, IRS and CCS can be provided. Surface Finish is Black Painted or Hot Dip Galvanized. Ship Chain Cable Accessories------Kenter Shackle, Anchor Shackle, Joining D shackle and Swivel Forerunner. We supplied lots of anchor chains to the shipyard, owner and stockist in many countries such as Singapore,Indonesia, Malaysia, Thailland, Finland, Russia,Nigeria and other countries.